How Do I Create Capability Combination Report for Individuals/Subgroups in Excel Using SigmaXL? Open the file Delivery Times.xlsx. 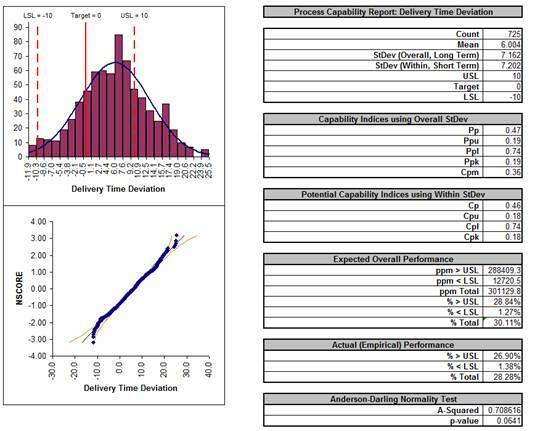 Click SigmaXL >Process Capability > Capability Combination Report (Individuals). To print this report, click SigmaXL Chart Tools > Print Charts. Do not use Excel’s print function. Cp is the “best case” potential capability index. Ppk is the “worst case” actual performance. If Cp is excellent (say Cp =2) and Ppk is poor (say Ppk < 1), this indicates that the process can be dramatically improved through centering and stabilizing. If Cp is poor, you will have to implement fundamental improvements using DMAIC to address common cause variation. 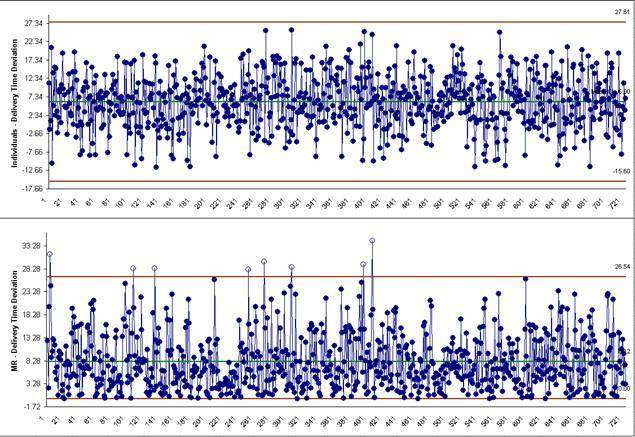 If Ppk = Cp, this indicates that the process is centered and stable, and the short-term (within subgroup) variation is the same as the long-term (overall) variation. Cpm is a similar statistic but it incorporates a penalty for deviation from target. 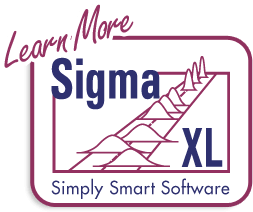 On a technical note regarding compatibility with other software tools, please be advised that SigmaXL does not use unbiasing constants when calculating Overall StDev, Pp, Ppk and Cpm. This is done in order to ensure that the calculated Overall StDev matches the results given in Descriptive Statistics. Note that Within StDev, Cp and Cpk are based on control chart techniques (MR-bar/d2 for Individuals Chart, R-bar/d2 for X-Bar & R, S-bar/c4 for X-Bar & S). 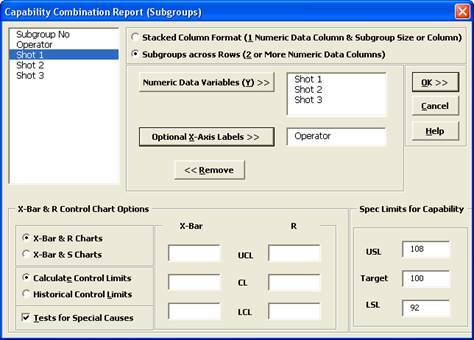 Open the file Catapult Data – Xbar Control Charts.xlsx. Each operator fires the catapult ball 3 times. The target distance is 100 inches. The Upper Specification Limit (USL) is 108 inches. The Lower Specification Limit (LSL) is 92 inches. 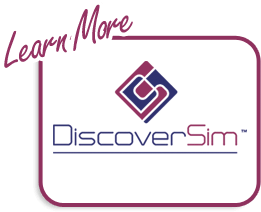 Select B2:F22; here, we will only use the first 20 subgroups to determine the process capability (subgroups 21 to 25 are studied later in Control Phase Tools: Statistical Process Control (SPC) Charts: Part B - X-Bar & Range Charts). 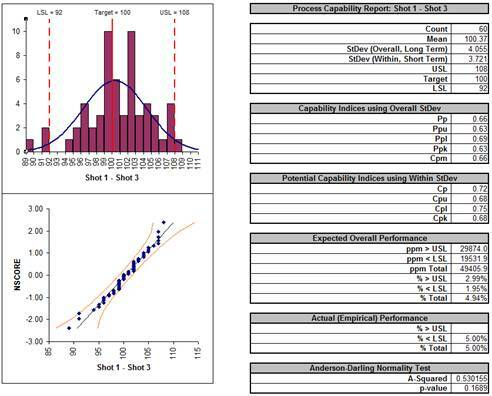 Select SigmaXL > Process Capability > Capability Combination Report (Subgroups). Do not check Use Entire Data Table!